http://heroesof2000ad.blogspot.co.uk/ is now available for your reading pleasure. I've mentioned it a few times before on the forums - in a nutshell, it's my attempt to do for 2000 AD's creator droids what Grant Goggans did for 2000 AD's thrills with his excellent 'Touched by the Hand of Tharg' site. http://www.2000ad.org/thrillpower/. To make it more exciting, I'll be drip-feeding the entries twice a week in sequence, but hopefully it'll remain as a resource. I aim to update entries with images as it's pretty bland currently. Read, share, enjoy, let me know what you think! Superb and long may it continue. Only had the chance to make a fleeting visit but fully intend to delve in later. Great idea, well done sir. 1) Tom was the uncredited colourist on many of the colour pages during the newsprint era, possibly the majority of them, given the number of times Steve Cook's excellent blog cites him as colourist on a cover or pin-up from that period. 2) According to Bear Alley's obit for Jack Potter, he was actually Steve Potter's father. 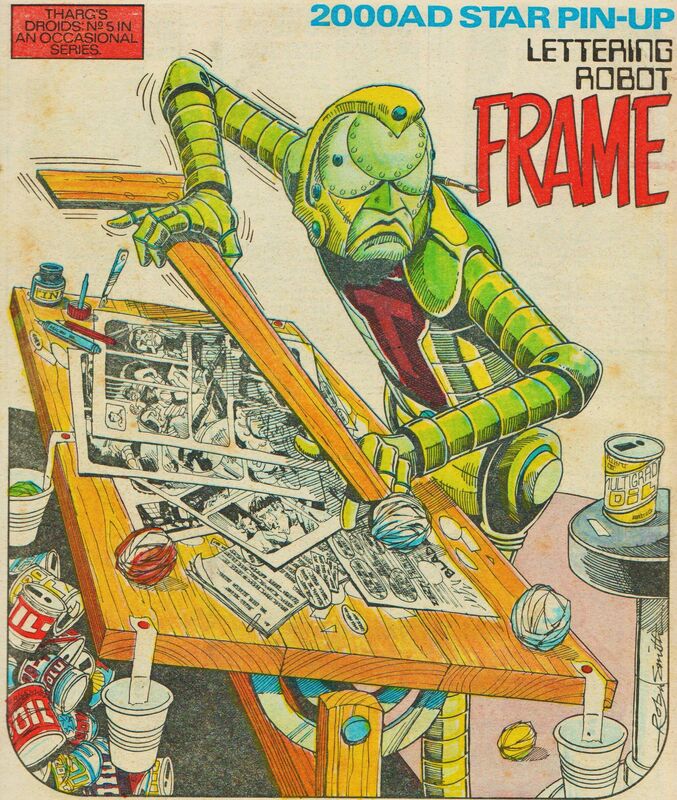 Tom Frame really was a key figure for 2000AD, wasn't he. This is a really great stuff - some very insightful analysis into the work of these comics giants, and extremely readable to boot! Re: your comment about Wagner's collaborations and Shako - I could be wrong, but I don't think they wrote it together - I think some episodes are Mills and some are Wagner. For some reason, I seem to recall someone saying he was a demon pool player, too! Truly great stuff, this - going to be a damn fine resource. Excellent stuff, looking forward to further entries. One little suggestion, some pictures might give your blog some more visual impact? Brilliant Blog Alex, well done. I have given it a plug on the Hibernia FB page, I think this deserves as wide an audience as possible. Just a correction on Pat Mills, Planet of the Damned was created and the first instalment scripted by Pat, but the rest by someone else, possibly Alan Hebden, and Wagners Walk has nothing to do with Pat, more than likely scripted by Finley-Day, and is a direct continuation of Hellman from Battle. R.E. Wright is the author of both, tells its own story. I have passed the Blog onto to Steve MacManus too, keep up the good work! The pool thing Jim, I think that came for the Deadline/Fleetway combined party (Christmas/after awards?) and was mentioned in Speakeasy or Comic World, I have them all pulled out, Ill see if I can find the mention. Of course, this Robin Smith star scan of the Frame droid made almost no sense without this piece of information…! I'd been under the impression that 'RE Wright' was a pseudonym used by Mills (according to his page on Barney, anyway). But I bow to your superior knowledge! It certainly makes sense that he started Planet of teh Damned off and then handed over scripting duties. Anyone know if there's a secret drawer somewhere with unprinted portraits of Tharg's droids? I've always wanted to know what Gerry Finley-Day looked like! Yep, all from the first episode - on top is page three, then page six, then page five. Smith's got them pretty spot on! This is a good idea for the blog actually, Alex - wouldn't it be good if wherever possible you could have one of the droid scans for each creator? I asked Pat Mills about it when I was doing Beyond 2000AD and he never heard of Wagners Walk, and Planet of the Damned was a leftover from the first issue of 2000AD that had not been used. The switch from monthly to weekly for the format of Starlord left a big hole in their first issues, so Planet of the Damned was dusted off. If you read Wagners Walk, and the last Hellman, its a direct continuation, and according to David Hunt, Finley-Day had been scripting Hellman in Battle.